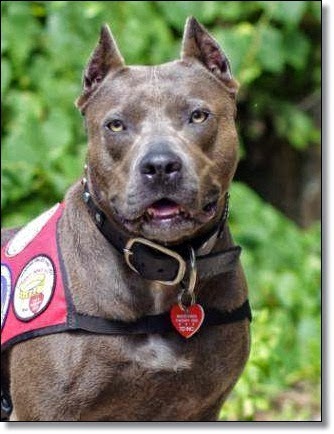 The nation’s top therapy dog, a pit bull named Elle (pronounced Ellie) from Roanoke Rapids, North Carolina who helps teach children about dog safety, reading, and overcoming prejudice and stereotypes – something a pit bull knows too much about – has been named this year’s “American Hero Dog” at the 2013 American Humane Association Hero Dog Awards™. Elle and her human companion Leah Brewer were presented with the nation’s top honors on October 5th at the star-studded Hero Dog Awards gala at the Beverly Hilton Hotel in Los Angeles. Elle is saving lives by teaching children dog safety (more than 2 million children are bitten by dogs each year) and making positive life changes for people by helping them overcome their fear of dogs. Since becoming a volunteer, Elle started a therapy dog reading program called "Tail Wagging Tales," helping children enjoy books and improve their reading skills. Elle is also making a difference by creating happiness all around while visiting her friends at an elementary school, a middle school, and a retirement home. Elle also reaches out to educate families about being responsible pet parents, sharing stories about her job as a therapy dog, and spreading positive awareness about dogs that are misunderstood, including pit bulls. This year’s therapy dog category sponsor, as well as the online sponsor, is the leading animal health company, Zoetis. 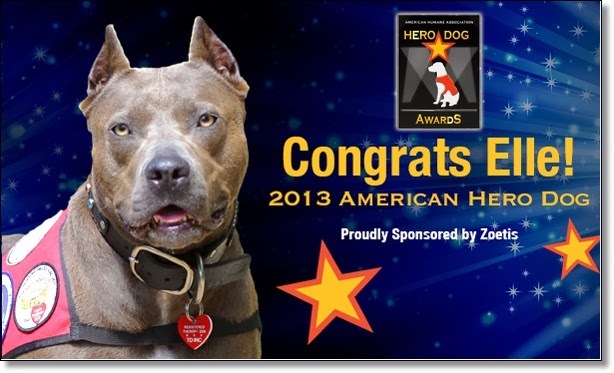 Congratulations to Elle, the "pit bull" therapy dog who has been named American Humane Associations 2013 American Hero Dog! Elle is making a difference in the lives of so many people and breaking down stereotypes about pit bull type dogs along the way. Way to go, Elle!